About African-Americans: "Most of them are drug dealers, on welfare and need to stop making babies, they're without ambition, and are the reason for rising crime in the community." About Rastafarians: "They must not be very educated people because why would they wear their hair like that. It's so nasty." About Haitians: "I don't understand how they are able to be in this country, and how did they get here?" These remarks – and more – were allegedly made by an Orange County government employee to a black colleague, according to a lawsuit filed in Orange County Circuit Court. Cindy D. Francis of Orlando accuses the county of firing her after she complained to supervisors, who allegedly did nothing as the abusive comments continued. 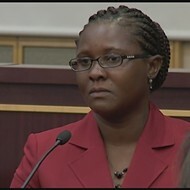 Until her firing in the summer of 2012, Francis was a clerk in the county extension office at 6021 S. Conway Road. In cooperation with the University of Florida – also a defendant in the lawsuit – the office offers food and housing services to low-income residents. In the lawsuit, Francis accused Mary Sue Kennington of repeatedly making offensive remarks about black people that created a hostile work environment. According to the lawsuit, a 2012 investigation by the University of Florida Institutional Equity and Diversity Department, initiated after Francis filed a complaint, concluded Kennington "did display inappropriate and unprofessional behavior." Francis said she brought her complaints to Richard Tyson, the county extension director, but was ignored. When she filed complaints against Kennington and Tyson with the county Office of Professional Standards in 2011, the lawsuit says, she started getting reprimands for being "rude and unfriendly," but she was never told who made the complaint, and she says she was given no information explaining what she had done. In February 2012, she filed a charge of race discrimination and retaliation with the EEOC, which the suit says was met with even more retaliatory measures. Ultimately, Francis' employment was terminated. Orange County spokesman Doreen Overstreet said in an email that the county does not comment on pending litigation. Messages to Kennington and Tyson were not returned. « How does Valencia’s former use of student volunteers to practice transvaginal ultrasounds stack up to other schools in the state? How does Valencia’s former use of student volunteers to practice transvaginal ultrasounds stack up to other schools in the state?